There are two sequences that really work in the mostly cliched "Dough," directed by John Goldschmidt, with a script co-written by Jez Freedman and Jonathan Benson. 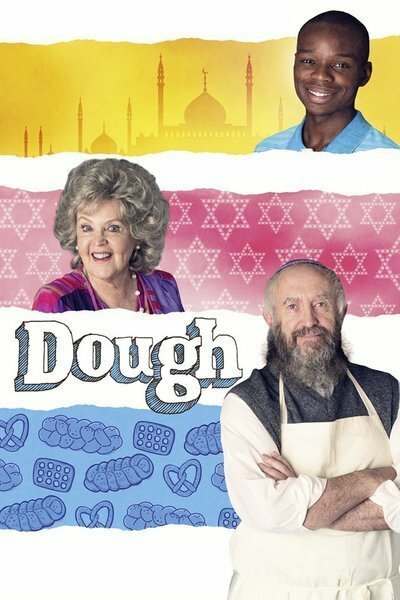 "Dough" tells the story of an old Jewish baker struggling to keep his small bakery open, and a Muslim immigrant kid from Darfur who gets work as the baker's apprentice. The opener is simply done and evocative, showing the baker's morning ritual, starting at 4 a.m., in conjunction with what the kid is up to at the same time (getting into potentially big trouble at a nightclub). The second sequence comes later in the film when the baker and the kid attempt to break into the main office of a sinister grocery-chain in order to steal back some possibly compromised muffins swiped from their store. Both sequences unfold with confidence, the first with a gentle introductory mood, the other playing out like it's the climax to a thriller. There are some good ideas in the film, albeit a bit obvious ("why can't we all look past our differences and get along? "), and albeit done much better in other films (primarily "The Visitor"). The wonderful Jonathan Pryce plays Nat, an elderly Jewish widower, who lives a circumscribed life of routine: He spends days at his bakery, watching his customer base dwindle away as the demographics of his neighborhood shift. He has movie nights with an old pal (his film choice is always "Singin' in the Rain," his late wife's favorite). He turns down the romantic advances of a vivacious recent widow (Nat says: "Your Morris died 6 weeks ago." She replies, "And only now am I beginning to move on.") His shop is in danger, and he has lost his apprentice to the competition. Jerome Holder plays Ayyash, a kid who fled Darfur with his mother, the fate of his father unknown. Ayyash and his mother live in a tenement, and he hangs out with a couple of buffoonish kids and yearns to start dealing drugs because he needs to make more money. Ayyash's mother sweeps the floors in Nat's bakery and when Nat loses his apprentice, she suggests he try her son out in the position. Everything that follows occurs like clockwork; everything right on schedule. Freedman and Benson know their episodic television. You know exactly how the entire film will play out within the first ten minutes. Nat and Ayyash will treat each other with suspicion, borne out of religious prejudice. They will end up becoming close. Ayyash needs a father figure and Nat will take on that role. On the flip side, Ayyash will help bring the staid Nat back to life. The script bounces through so many predictable plots, including a conflict with an evil real estate developer who actually cackles with glee after a meeting with Nat. The film is not subtle, and telegraphs "who people are" with the broadest of strokes. Each scene presents some obvious "problem" that needs to be solved, and one sees the solution coming from a mile away. The big ensemble, multiple storylines, the essential "conflict" set up in the first sequence, and on and on, are reminiscent of old-fashioned episodic television. There's very little subtext in "Dough." Ayyash makes cracks about Jews baking with blood. Nat asks Ayyash please to not pray to Mecca in the front room of his bakery. Jonathan Pryce can't help but act everybody else off the screen; the other actors look amateurish in comparison. Pryce's Nat is a fussy old guy, attached to the bakery which has been in his family for generations, putting off romance and totally stuck. Pryce's work is lovely, and, in a couple of moments late in the film, when Ayyash betrays his trust, he is heartbreaking. He does a lot with a very thinly written role. Jerome Holder struggles to keep up with Pryce, but lacks any subtlety of approach. Ayyash's attempts to start dealing drugs for extra cash (he doesn't do drugs himself) feels pre-determined, a bossy plot-point, although there is a funny plot-twist when Ayyash comes up with an idea of how to sell more drugs under cover of Nat's business. But the relationship between the two has no resonance, no depth. "Dough" has the best of intentions, and it has a good heart. While it is no doubt true that getting to know a person as an individual often helps to crack apart prejudice, "Dough" presents the conflict between Muslim and Jew—a seemingly intractable one over which people have been warring for millennia—in a simplistic manner, with problems easily surmounted. Everyone involved in "Dough" means well, and criticizing it feels like criticizing a poorly-written personal essay by an earnest middle-schooler. You think, "You've got a good heart, kid. Keep it up. Keep believing that humans are good. We need that belief in the world. But work harder on your writing."